Parents, community members, and taxpayers across the nation have been loud and clear regarding what they expect from public schools. 1) They want accountability; but do not want schools turned into centers of testing and test preparation instead of centers of learning. 2) They want safe, student-centered, and instructionally-rich environments that include art, music, and P.E. 3) They want reasonable class sizes and believe that class-size matters. 4) They want stronger local control and less federal and state control. 5) They want less standardization, less intrusive rules, less tests, and less data collection. 6) They want to retain parent rights, and not have them weakened by new FERPA regulations. Education policy-wonks, education reformers, foundations, and legislators in both establishments persist in ignoring these concerns and persist in forcing their definition of education reform. According to Public Disclosure Commission filings posted Tuesday, Yes On 1240 has raised a total of $2.3 million and spent about $2.1 million to gather about 350,000 signatures. Most of the money has come from Washington technology leaders, including Microsoft co-founder Bill Gates, who donated $1 million. Other reported funds and funders of the petition drive included $100,000 from Microsoft co-founder Paul Allen, and $200,000 from Katherine Binder, chairwoman of EMFCO Holdings, $150,000 has been donated to the campaign from out-of-state, and $50,000 from Democrats for Education Reform, which is based in New York but has a presence in Washington state. The successful petition drive was organized by Winner & Mandabach of Santa Monica, California, a company that specializes in "big-buck initiatives." Initiative Measure No. 1240 concerns creation of a public charter school system. This measure would allow a newly-created state commission or approved local school boards to authorize qualifying nonreligious, nonprofit organizations to operate public charter schools, limited to forty schools over five years. Public charter schools would receive standard per-student public school funding and be open to all students without tuition. Public charter schools would be subject to teacher certification requirements, government oversight, and performance reporting requirements, but exempt from certain state laws and school district policies. What voters are unlikely to read is the 39-page detailed implementation plan or the "conversion charters" plan tucked within it. These new public charters would be free of regulations required of the public schools except for testing requirements. Conversion charters permit parents or teachers to vote to turn a standard public school into a charter school via a petition process. While controversial so-called parent trigger laws are restricted to low performing schools and rely on a petition process, this ballot initiative allows any school including high performing schools to "convert." "...there is no parent or teacher “trigger” in I-1240. Under I-1240, it’s possible for a traditional public school to convert to a charter school only if the school meets rigorous application requirements, and demonstrates community need and parent and community support. One additional requirement before that conversion could happen is that either a majority of the parents or a majority of the teachers would have to sign a petition supporting the conversion. However, this is an additional requirement to demonstrate support for the school — a petition alone would mean nothing." Parents, community members, and taxpayers are not so easily fooled by changes in a word or two and creating new definitions. Pass it now, fix it later is a bad idea. The devil is in the details, or lack of, and Washington state voters would do well to reject this ballot initiative. What is clear for the rest of the nation is that charter expansion for all is the goal. While public schools strain under regulations, public charters would not. How does this make any sense? Wouldn't the public be better served by wider discussion of what type of customized conversion schools would be developed even in those areas where students demonstrate high achievement? How do customized schools navigate in a standardized-driven top down environment? Without that conversation first, how much more experimentation on children should the taxpayers be willing to pay for? Below is a section of the final text of the ballot measure that references a conversion. (9) "New charter school" means any charter school established under this chapter that is not a conversion charter school. Sec. 205: (3) A conversion charter school must provide sufficient capacity to enroll all students who wish to remain enrolled in the school after its conversion to a charter school, and may not displace students enrolled before the chartering process. Sec. 213: (3) In the case of an application to establish a conversion charter school, the applicant must also demonstrate support for the proposed conversion by a petition signed by a majority of teachers assigned to the school or a petition signed by a majority of parents of students in the school. Sec. 222: (6) Conversion charter schools are eligible for local levy moneys approved by the voters before the conversion start-up date of the school as determined by the authorizer, and the school district must allocate levy moneys to a conversion charter school. This is great! Every public school supporter in Washington state needs to share this with their friends, family, and colleagues. The "conversion" plan hidden in this could be devastating to public schools! This is an invaluable tool for Washington folks to use to explain this initiative to friends,families, and colleagues. This notion will spread under the slogan of scholol choice for all. Washington is an example of coming attractions Floridians would be wise to keep this story in mind. 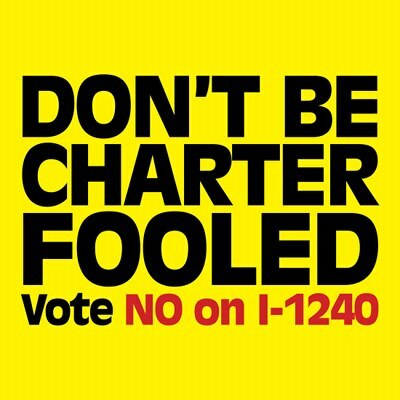 I'm the head of the No on 1240 campaign and we appreciate the thread and the support. We believe that if we hold this off - for the 4th time (we've voted down charters three times in the past) - that we can lead the way for other states. We don't want to see the situations that have arisen in other states to visit our state. Our win could mean new directions for other states to either shake them off or at least get stricter laws. The "conversion" trigger is the most harsh in the entire country. It would allow takeover of ANY school, failing or not, by an approved charter by a majority of signatures by EITHER teachers or parents. So if you have 18 teachers in an elementary school, 10 could sign a petition and upend an entire school community. We are dealing with some wealthy (Bill Gates, an heiress from WalMart, the head of Netflicks, etc) who want charters here. But we believe that with education, we can win this one and we intend to do just that. Thanks again and follow us at Facebook (No on 1240) or at Twitter (No_On_1240). Grumpy Educators will continue to follow events in Washington on this ballot initiative. It matters. Thank you for sharing Washington I-1240. Great article, I shared it on my facebook page. Also, please check out FAQ's on www.no1240.org. Gee whiz. I'm so confused at this point. The people pushing I-1240 keep insisting that "There Is No Trigger!" And they say it with such absolute rage---as if such a claim was some sort of insult. Is it? Make up your mind, you Education Privatizers. You've just spent a month crowing about this supposedly "wonderful film" called "Won't Back Down", starring Ann Coulter and directed by Leni Riefenstahl, and it's all about "this great new thing called the Parent Trigger!" Are you claiming otherwise now? If the "Parent Trigger" was so terrific, why aren't you crowing about it? Why didn't you put it in the name of your ballot measure? And why did you apparently change the name when it appears in I-1240? So, here's the question for the I-1240 folks: Is there a "trigger" or not, by any name, in the 1240 ballot measure? And, do you now agree with those of us who know that the trigger would be a disaster for our schools and destroy every good thing about our public education? At this point, it is clear to all across the nation that a petition signed by parents or teachers to convert to a charter is a trigger. That proponents have added other elements beyond the petition does not change that fact.